Mississauga, Ont. – Nissan announced Canadian pricing for the 2019 370Z Coupe, 370Z NISMO and 370Z Roadster, which are on sale now at Nissan dealers nationwide. 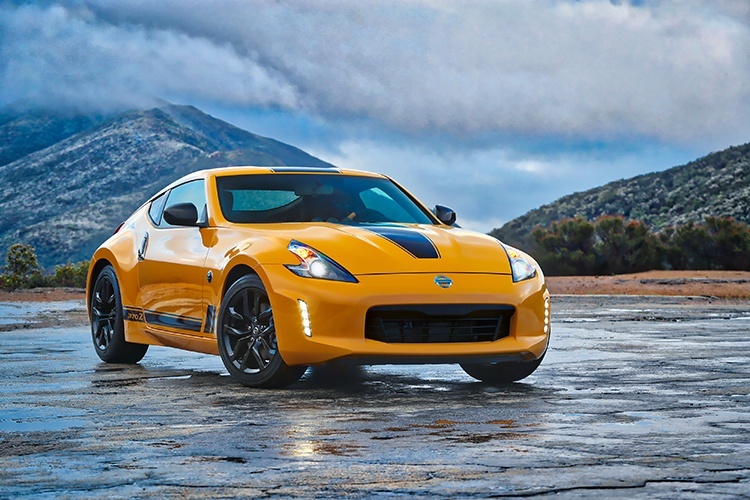 Nissan’s iconic sports car presents tremendous value with the starting Manufacturer’s Suggested Retail Price (MSRP)1 for the entry-level 370Z Coupe unchanged for four model years in-a-row – $29,998. For 2019, the Heritage Edition package is now offered on the base 370Z. Intended for 370Z Coupe buyers who want to stand out from the crowd even further, the new Heritage Edition package is available in two exterior colours – Deep Blue Pearl and Chicane Yellow. The Chicane Yellow Heritage Edition features black outside mirrors, gloss black graphics and yellow interior trim. In addition to the Heritage Edition, Nissan’s iconic 370Z Coupe enters 2019 with standard auto-dimming rearview mirror with RearView Monitor. Following major enhancements for the 2018 model year – including a revised exterior featuring dark headlight treatment, dark tinted rear combination lights, a blackout rear lower fascia and redesigned 19-inch aluminum-alloy wheel design – Nissan’s iconic 370Z Coupe enters 2019 with two new color themes for the 370Z Heritage Edition, standard auto-dimming rearview mirror with RearView Monitor, and the combining of the previous Touring and Sport Tech trim levels into a new Sport Touring grade. The flagship 370Z NISMO carries over all of the significant changes from 2018 – including the Dunlop SP Sport MAXX GT600 high-performance tires and addition of the EXEDY® high-performance clutch. The 2019 Nissan 370Z Roadster continues to offer an unmatched balance of dynamic performance, sculptured styling, innovative technology and exceptional value – along with the exhilaration of pure open-air motoring. It is offered in two trim levels: 370Z Touring Roadster and 370Z Sport Touring Roadster. For 2019, the 370Z Roaster adds an auto-dimming rearview mirror with RearView Monitor as standard on all models. The 2019 Nissan Z® is offered in a total of seven models – four 370Z Coupe models, one 370Z NISMO model and two 370Z Roadster models. Following major enhancements for the 2018 model year – including a revised exterior featuring dark headlight treatment, dark tinted rear combination lights, a blackout rear lower fascia and redesigned 19-inch aluminum-alloy wheel design – Nissan’s iconic 370Z Coupe enters 2019 with two colour themes for the 370Z Heritage Edition, and standard auto-dimming rearview mirror with RearView Monitor. The 2019 370Z Coupe Heritage Edition package offers a unique appearance and is available in two exterior colours – Deep Blue Pearl Heritage Edition (black outside mirrors, gloss silver decals, yellow interior trim) and Chicane Yellow Heritage Edition (black outside mirrors, gloss black decals, yellow interior trim). The 2019 Nissan 370Z Coupe once again offers extraordinary performance, design and an unmatched heritage. Each 370Z model comes equipped with a standard 332-horsepower 3.7-litre DOHC V6 engine with Variable Valve Event and Lift Control (VVEL), and choice of 6-speed manual transmission with an available SynchroRev Match® technology or a 7-speed automatic transmission with paddle shifters. 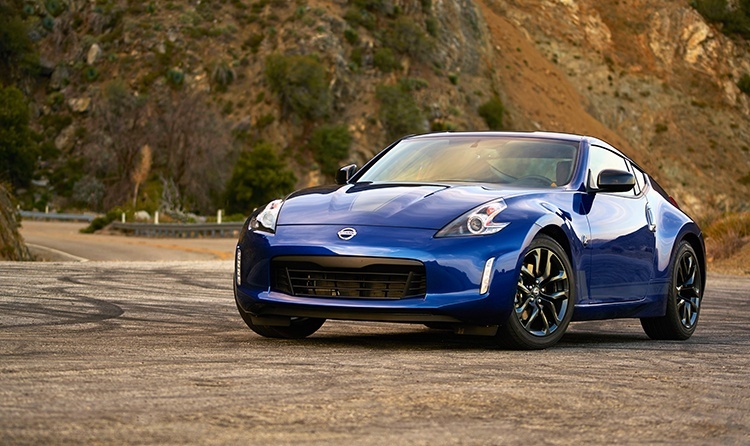 For Nissan 370Z enthusiasts, one model stands above the rest: the 370Z NISMO. It’s the one wearing the instantly recognized black-and-red NISMO badge. Again in 2019, the 370Z NISMO’s GT-R-inspired functional and fully integrated aerodynamic body pieces provide an aggressive and more aerodynamic appearance, along with optimizing front and rear downforce. The standard 19-inch NISMO super-lightweight forged aluminum- alloy wheels by RAYS feature a twin-five spoke design and a charcoal gray machine-finish. Inside, the unique NISMO-styled interior features black-and-red Recaro® leather-appointed seats with Alcantara® accents. The 370Z NISMO is powered by a potent 350-horsepower 3.7-litre DOHC V6 engine with Variable Valve Event and Lift Control (VVEL). Torque is rated at 276 lb-ft. One transmission choice is offered for the 370Z NISMO model – a close-ratio 6-speed manual transmission with standard SynchroRev Match®. The 370Z NISMO also features a refined 4-wheel independent suspension, NISMO- branded strut tower brace for enhanced body rigidity and a pair of performance dampers to help minimize road-input vibrations and help contribute to the 370Z NISMO’s high levels of handling and performance feel. Large Nissan Sport Brakes and a Viscous Limited-Slip Differential (VLSD) are also standard. The 2019 Nissan 370Z Roadster is available in a choice of two well-equipped grades: 370Z Touring Roadster and 370Z Touring Sport Roadster. For 2019, the 370Z Roaster adds an auto-dimming rearview mirror with RearView Monitor as standard on all models. The convertible top, which is designed to provide a sleek silhouette matching the 370Z Coupe’s stunning styling with the top up or down, features an easy, single-action open-close operation. The 370Z Roadster’s interior is completely driver-centric, with its three-layer design grouping items by how a driver sees information, operates the controls and is held in place – so drivers feel completely connected and engaged. The 370Z Roadster’s outstanding performance is anchored by a 332-horsepower 3.7-litre DOHC V6 engine with Variable Valve Event and Lift Control (VVEL) matched with either an electronically controlled 7-speed automatic transmission with Downshift Rev Matching (DRM) and standard paddle shifters, or a close-ratio 6-speed manual with available SynchroRev Match®. Responsive handling is provided by a refined 4-wheel independent suspension. The long list of standard equipment on the 370Z Roadster Touring, includes Bluetooth® Hands-free Phone System, USB input, black-finished 18-inch aluminum-alloy wheels, Nissan Navigation System with 7.0-inch touch- sensitive display, Bose® Audio System, cooling and heated ventilated leather-appointed seats and RearView Monitor. The top-of-the-line 370Z Roadster Touring Sport includes, 19-inch RAYS super lightweight forged aluminum-alloy wheels and Nissan Sport Brakes.